All beautifully finished off with luxury cellophane, bow and curling ribbon. Creating a stunning gift with the wow factor! 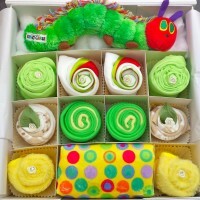 Delivery (to UK Mainland) Small keepsake gift box sets (includes cupcakes) Our small keepsake gift box sets (Bronze sets and cupcakes) are sent via Royal Mail 1st Class Recorded after the gift has been made and a flat rate of £4.99 is applied at checkout. (to UK Mainland). Please note the lead times at the bottom of the individual product pages for making up the gift set. Large keepsake gift box sets Our large keepsake gift box sets (Silver sets including bathtime bronze) are sent via courier on a 24 hour trackable service after the gift has been made and will require a signature on arrival. A flat rate of £4.99 is applied at checkout. (to UK Mainland). Please note the lead times at the bottom of the individual product pages for making up the gift set. 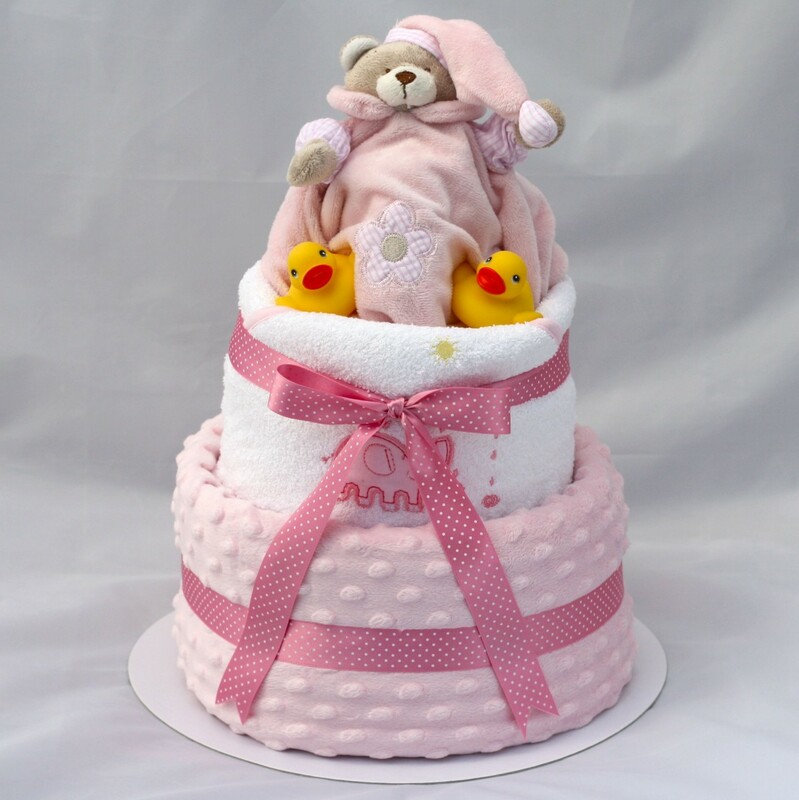 Nappy cakes and baby clothing bouquets These are sent via courier on a 24 hour trackable service after the gift has been made and will require a signature on arrival. A flat rate of £5.99 is applied at checkout. (to UK Mainland). Please note the lead times at the bottom of the individual product pages for making up the gift set. D.I.Y orders All items in our DIY section are sent via Royal Mail 1st Class Recorded (£4.99) no matter how many items you buy! (to UK Mainland). If your order is over £20 excluding delivery, your gifts will be presented in one of our gorgeous keepsake gift boxes. 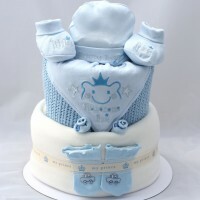 If you would prefer your DIY items to be presented as a luxury nappy cake, bouquet or cupcake, please contact us with your choices and we will provide you with a quotation. 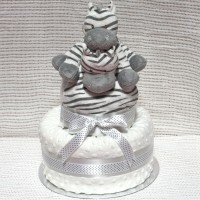 We can also present your gifts with a keepsake box and a nappy cake combined, which is even more unique! If any gifts are urgent please email us at info@corporatebaby.com or contact us on 07843 246730 and we will endeavour to meet your delivery deadline! Delivery Outside UK Mainland We can deliver our gifts anywhere in the world. For delivery outside UK Mainland please contact us either by phone or email for postage costs. What happens if the recipient is not in to receive the delivery? If the recipient is not home to receive the delivery, Royal Mail will leave a card for them to collect from the main sorting office (for recorded items only) or with the courier option a card is left and the recipient can arrange a re-delivery directly with the courier at a suitable time for them. Packaging Luxury keepsake gift boxes small or large Clothing is lovingly wrapped in luxury tissue paper and presented in a small or large pink, blue, white or ivory keepsake/gift box depending on collection chosen. It is then wrapped in bubble wrap and finally in colour co-ordinated cellophane. Included with every gift box is a handmade gift card with your chosen message sending congratulations upon the arrival of a new bundle of joy. 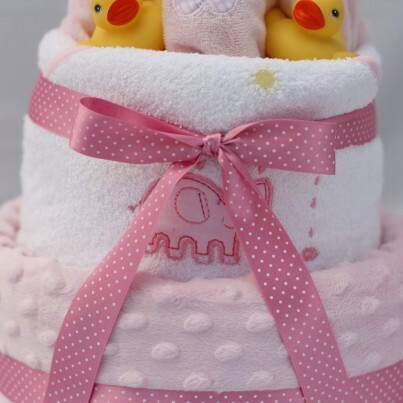 Luxury Nappy Cakes, baby clothing bouquets and cupcakes All of our nappy cakes, bouquets and cupcakes are finished to a very high standard and are beautifully gift wrapped with high quality celophane, ribbons and bows, all colour co-ordinated to your chosen gift. A handmade gift card is included in every order, personalised with your own message. All gifts are then packed in a strong outer mailer box with plenty of bubble wrap for extra protection. All sizes are specified on each product. If you would like us to source premature or large size clothing please do contact us. Terms and Conditions All items sold on this website must be kept away from fire. Please read the following terms and conditions carefully - you may wish to print this page for future reference. 1. Company Details Corporate Baby is a UK business based in Surrey, established in May 2006 Office Address: Corporate Baby 5 Tillingbourne Road Shalford Surrey GU4 8EY 2. 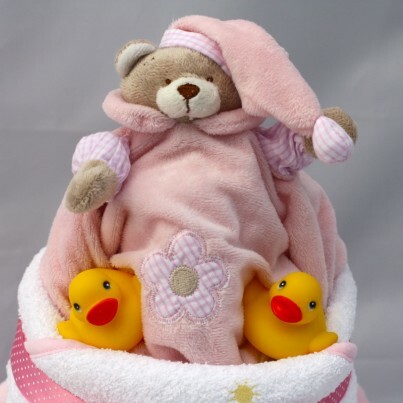 Contact Details Corporate Baby 5 Tillingbourne Road Shalford Surrey GU4 8EY Phone: 07843 246730 Email: info@corporatebaby.com All prices are shown in GB Pounds Sterling and include packaging. Clothing will be wrapped in delicate tissue and presented in our beautiful memory box for orders over £15. Each gift box is wrapped in bubble wrap and then celophane. We aim to deliver within five working days from receipt of order. All deliveries are subject to payment authorisation. If an item is temporarily out of stock a substitution of similar style but same value will be made. We cannot be held liable for any loss you may suffer as a result of late delivery or cancellation of your order. If a baby gift is returned to us due to the address being incorrect or the recipient has not collected it from the Royal Mail Depot after a delivery attempt and note left, a second delivery charge will be incurred to resend the gift out again. If you have any questions regarding delivery please e-mail us or telephone 07843 246730 quoting your order number. Corporate Baby offer a 14 day money back guarantee. If for any reason you are not entirely happy with your purchase, we will give a full refund provided that goods are returned to us in perfect condition with the original packaging, by Royal Mail Special delivery, within 14 days of you having received them. NB: Due to hygiene reasons we cannot accept the return of items which have been worn. Please check the goods on delivery. If goods are delivered damaged of faulty you must inform us within 5 days of delivery and we will arrange collection and replacement at our expense. If you do not inform us within 5 days we shall have no liability for goods said to be damaged on delivery. This does not affect your statutory rights. To order goods you must be at least 18 years of age. Images may not show the actual size of items. 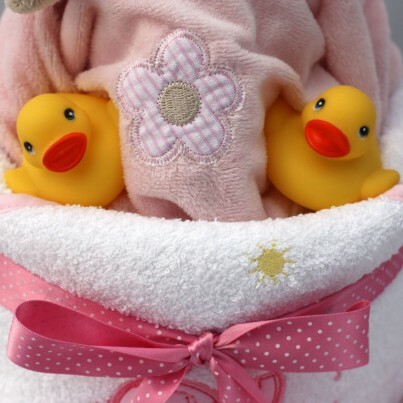 ALL garments are suitable for a newborn baby + where stated. We can also source premature baby clothing as well as 3 month + baby clothes, please contact us for more details. E & OE. Corporate Baby reserves the right to refuse the supply of goods at its discretion. If any provision of these terms and conditions shall be unlawful, void or for any reason unenforceable then that provision shall be excluded and shall not affect the validity and enforceability of the remaining terms and conditions. Any disputes not resolved by normal complaints procedure will be resolved exclusively in the courts of England and Wales under English Law. These terms and conditions are subject to change at any time without prior notice to you. We recommend that you print and keep a copy of these terms and conditions. All images show on this website and our website are owned by Corporate Baby. Corporate Baby offer a 14 day money back guarantee. If for any reason you are not entirely happy with your purchase, we will give a full refund provided that goods are returned to us in perfect condition with the original packaging, by Royal Mail Special delivery, within 14 days of you having received them. NB: Due to hygiene reasons we cannot accept the return of items which have been worn. Please check the goods on delivery. If goods are delivered damaged of faulty you must inform us within 5 days of delivery and we will arrange collection and replacement at our expense. If you do not inform us within 5 days we shall have no liability for goods said to be damaged on delivery. This does not affect your statutory rights.